It’s easy! Place a banana in the middle of your plate, then cut an apple into slices to make the wings. Spread some yogurt on the apple slices, then put raisins on top of the yogurt. You could also use some pretzel sticks for the antennae, but we didn’t have pretzel sticks, so we skipped it. You could use a variety of fruits here, first that comes to mind is orange slices in place of the apple slices. You could use mint leaves for the antennae as well. 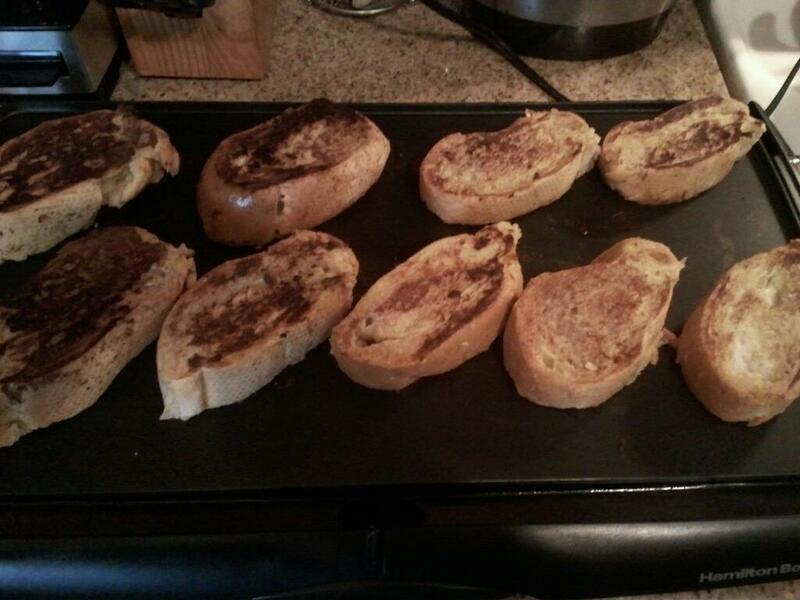 It’s been a while since I’ve made French toast, so I looked up a few recipes and came up with this combination. 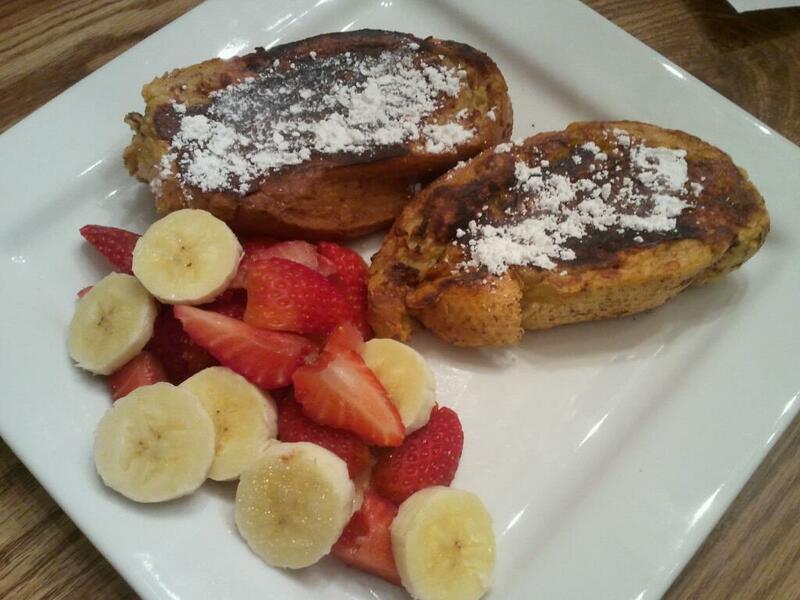 I put a little powdered sugar on top, and served it with cut strawberries and bananas. My older daughter thought it was beautiful! And delicious. In a bowl, whisk together, milk, eggs, honey, cinnamon, and vanilla extract. Pour mixture into a pie pan. Dip each slice of bread in the mixture, allowing both sides of bread to soak for a few seconds. Place each slice in a skillet or on an electric griddle and cook until golden brown on each side, about 2-3 minutes for each side. Serve with powdered sugar, syrup, and fresh fruit, if desired. Since it was already pretty ripe and I haven’t had much time to cook lately, I did what we do with a lot of our fruit – make smoothies! 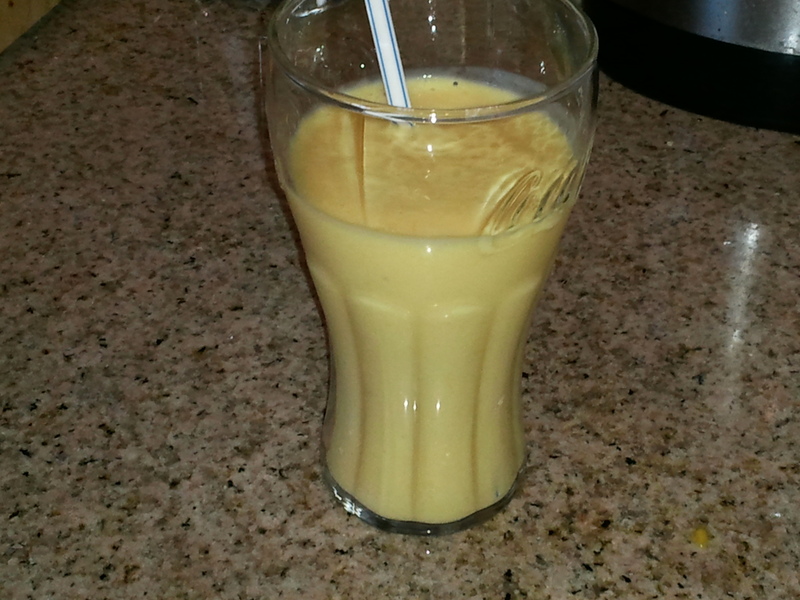 I used a papaya, some pineapple, a banana, 1 cup of milk, and ice cubes. It was pretty tasty! These muffins turned out great! 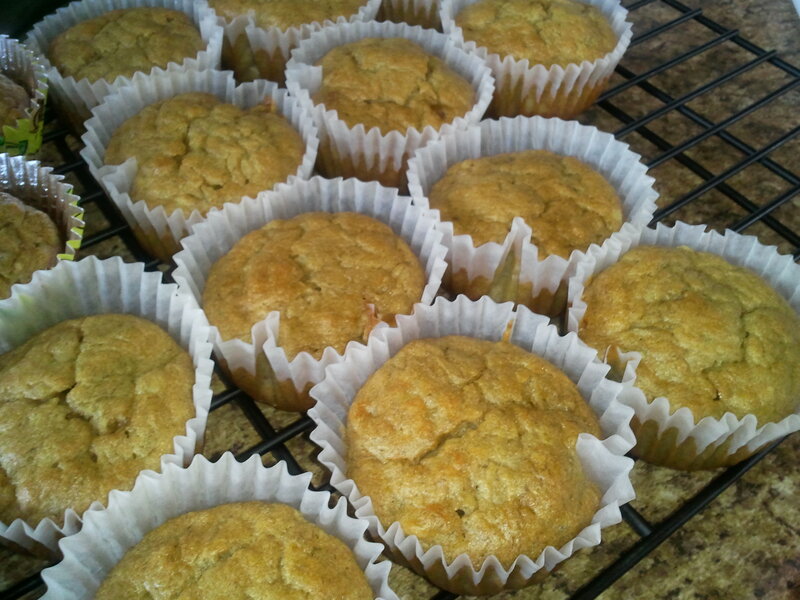 I love the banana muffin recipe I use, it has a very strong banana taste. 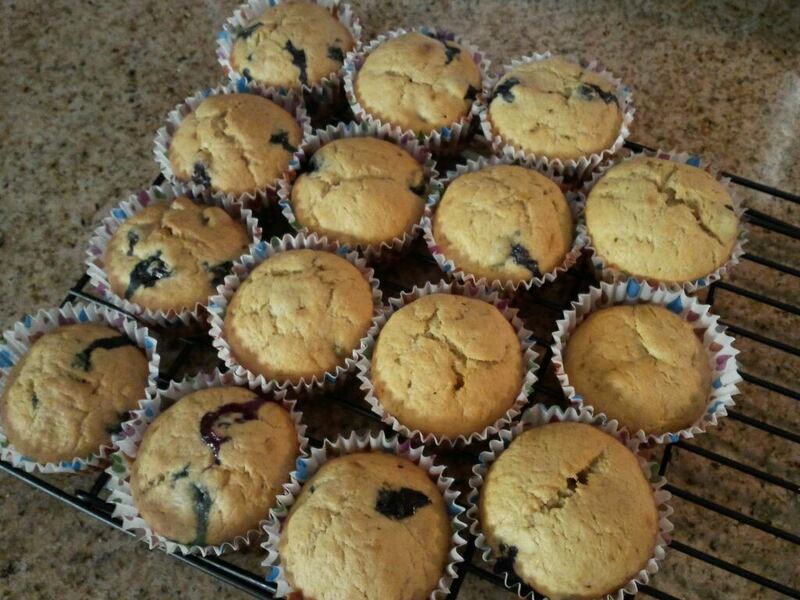 So, since I had gotten blueberries as an extra from Bountiful Baskets, I put them some to use in these muffins today. 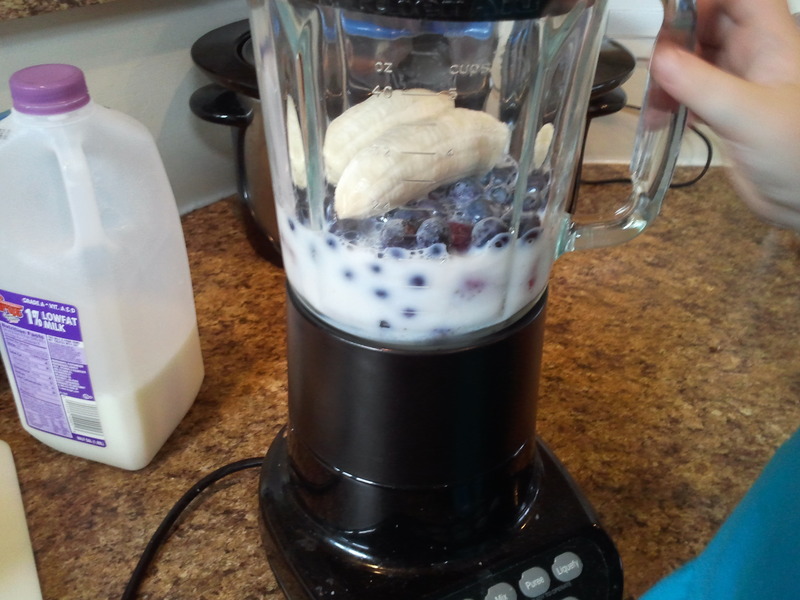 The banana and blueberries go together very well. Preheat oven to 350 F. Lightly grease the bottoms of a muffin pan or line with paper liners. In a medium bowl, combine flour, baking soda and salt. In a separate bowl, cream together butter and brown sugar. Stir in eggs and mashed bananas until well blended. Stir flour mixture into banana mixture; stir just to moisten. Fold in blueberries. Pour batter into prepared muffin cups. Bake in preheated oven for 20 to 25 minutes. Cool muffins on a wire rack. Makes 18-24 muffins. We have a had time eating mangoes just on their own. So, what do we do with fruit that we don’t get eaten? Make smoothies! Put all ingredients in blender and puree until smooth. Last night was one of those nights where I was lost on what to cook. I had ideas, but needed to run to the store if I wanted to be able to make any of them. K was whiny after school, and it’s probably better that we didn’t go because it has been raining all evening. My girls were both getting hungry, so I decided to make them smoothies. I still have plenty of strawberries and blueberries in my freezer, I bought them back in June/July when both were really cheap. 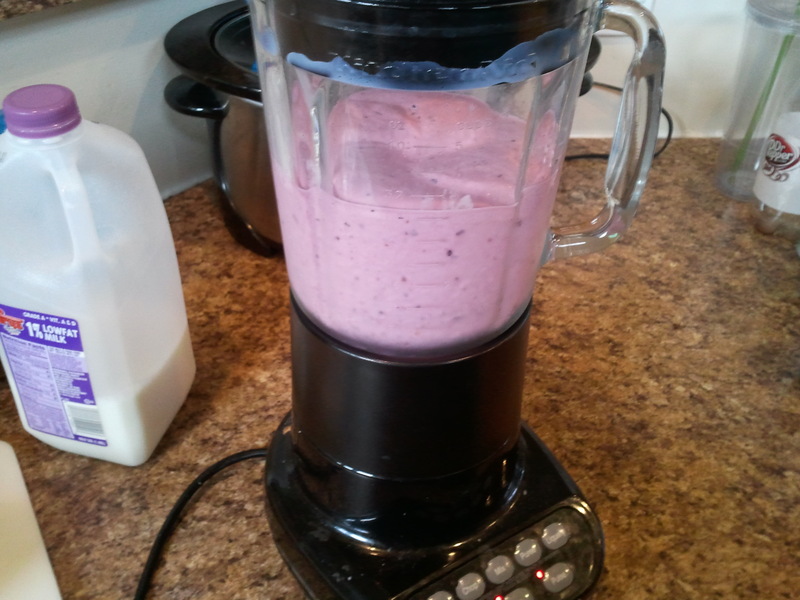 I added about 1 1/2 cups of frozen strawberries, 1/2 cup frozen blueberries, and 1 banana to my blender. I poured in milk until it came up to about the 2 cup line on my blender. If you use fresh berries instead of frozen, you will need to add in 1/2 cup of ice. I then turned it on and pureed until well blended. Both girls were very happy! Each week in Bountiful Baskets, I get a nice assortment of fruit. It mostly gets eaten outright, but lately it’s been tough for us to get through it before it goes bad. Or, it’s just something we don’t particularly like a lot. This week and last week, I got pears and nectarines that have sat, and the plums I got last week were starting to not look great anymore. 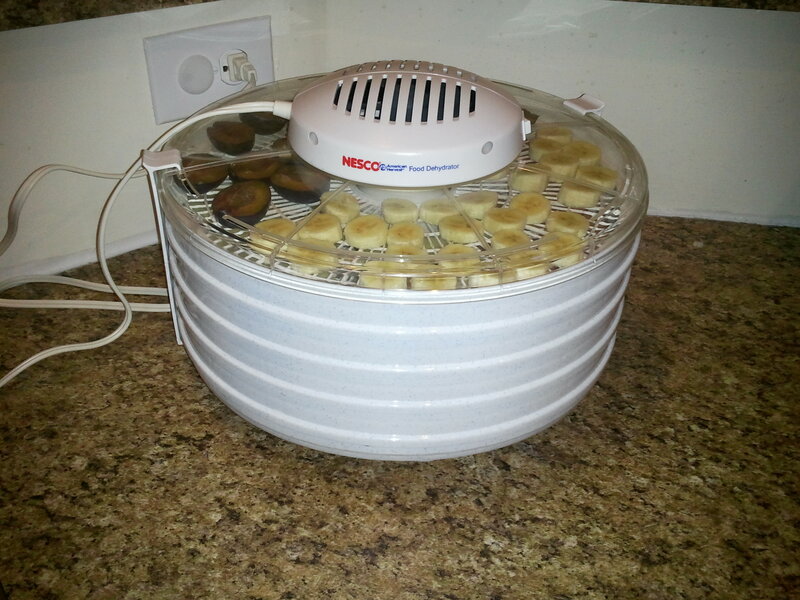 While trying to decide what to do with the pears, my friend D got a new fruit dehydrator to make raisins with the grapes we got. I decided to ask to borrow it to at least dehydrate my pears and I picked it up yesterday. Since you need the base and at least 4 trays, I decided I would try doing the nectarines, plums, and a couple bananas, plus we ended up putting a Granny Smith apple in too. 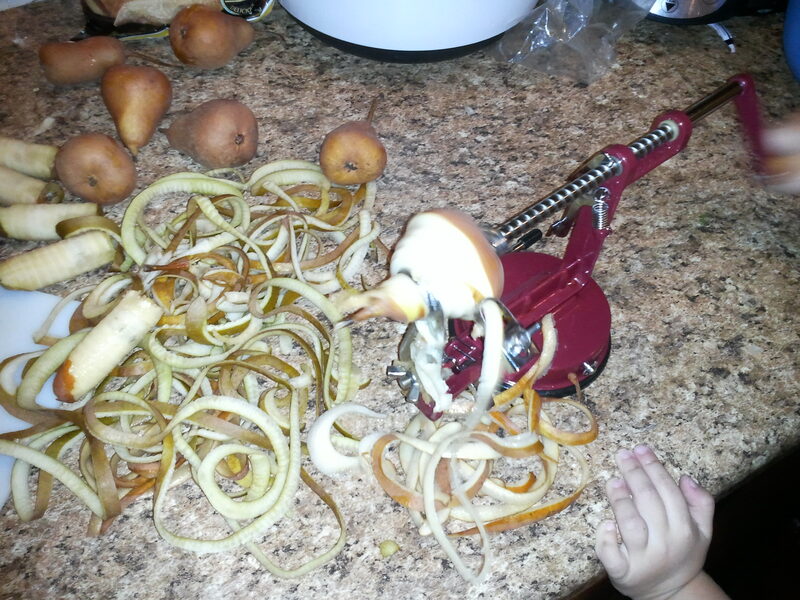 For the pears and the apple, I got out our peeler/corer/slicer. 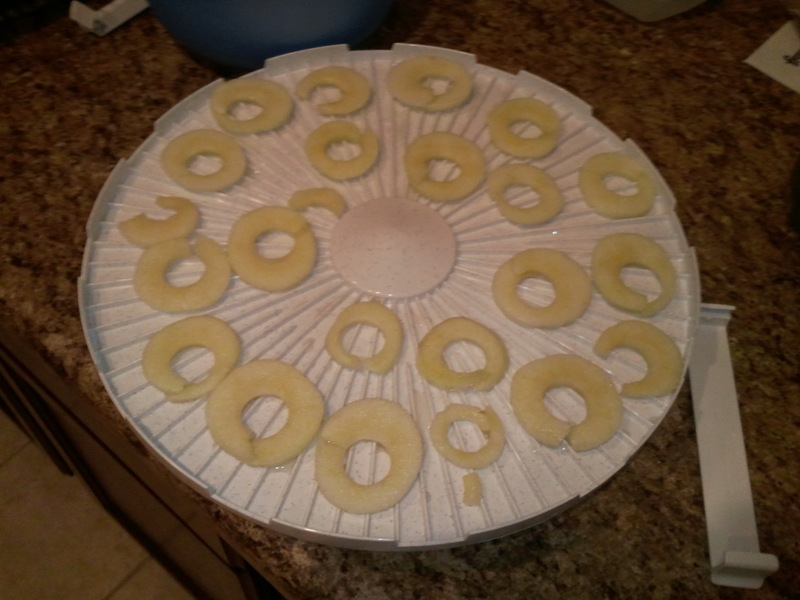 Seriously, one of the best inventions for prepping pears and apples. My girls love helping me use it. Next, the pears, apples, and nectarines all need to be pre-treated to prevent them from browning. There are a variety of options to do this, but I chose soaking them in lemon juice. D had dehydrated her pears and dipped them in lemon juice, but felt like the lemon taste stayed with them, so I diluted my lemon juice with water, 50/50 ratio. I left it in there about 5 minutes. The plums I cut in half and removed the pits, the bananas I cut into 3/8″ slices. I arranged it all on the trays, stacked the trays, plugged it in, and flipped the switch. I let it run overnight, approximately 10 hours and here is what I woke up to. It’s a browner than I wanted it to be, but it’s still sweet and full of flavor. I think I may have left it in the dehydrator too long, probably should have started it later in the evening. Also, I wonder if some of it was not in the lemon juice long enough or if my diluting the lemon juice had some effect. 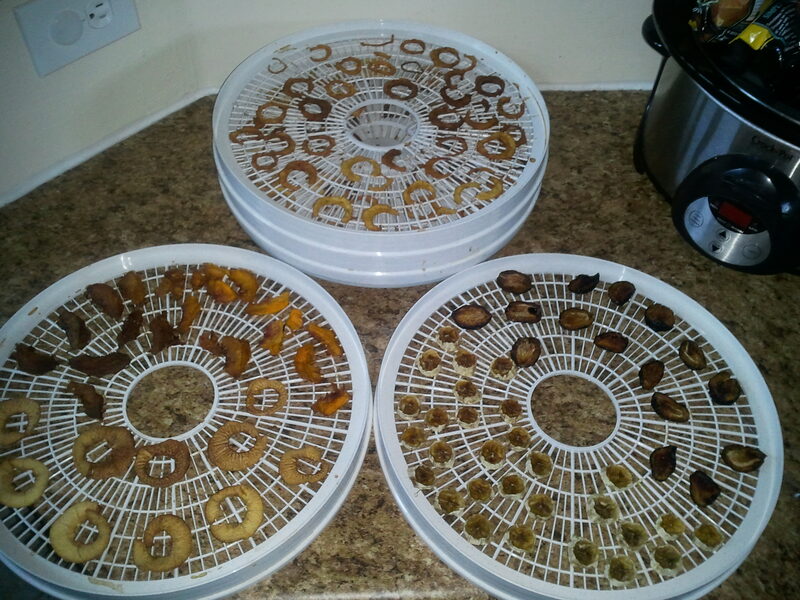 Still a good experiment and thanks to D for letting me borrow the dehydrator! I had some bananas from either 8/20 or 8/27 Bountiful Baskets that didn’t get eaten, so I left them out to over-ripen to make either bread or muffins. 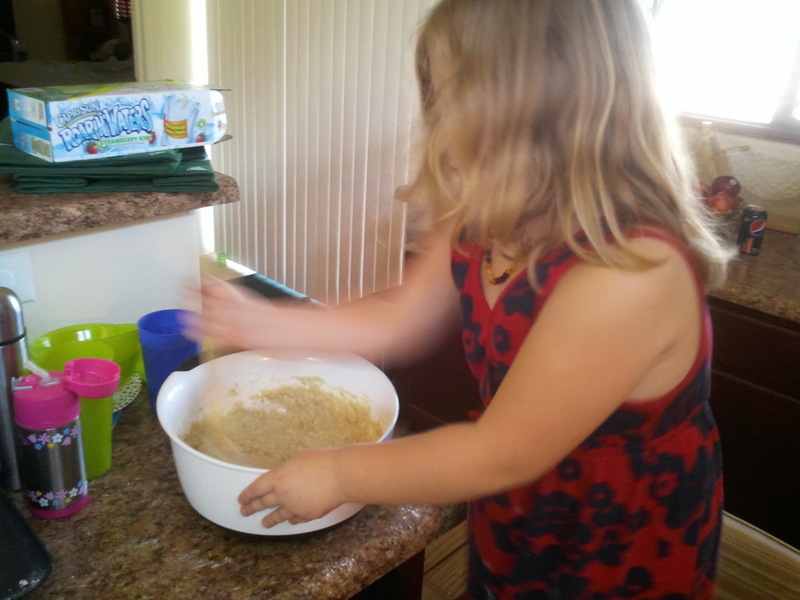 Today, I decided we would make muffins. The recipe I use is Banana Banana Bread from allrecipes.com. It is really tasty and very moist, something that can be tough for banana bread. In order to make muffins, I just changed the baking time to 20-25 minutes. A trick I learned when making muffins or cookies is to use a scoop to get the perfect amount. 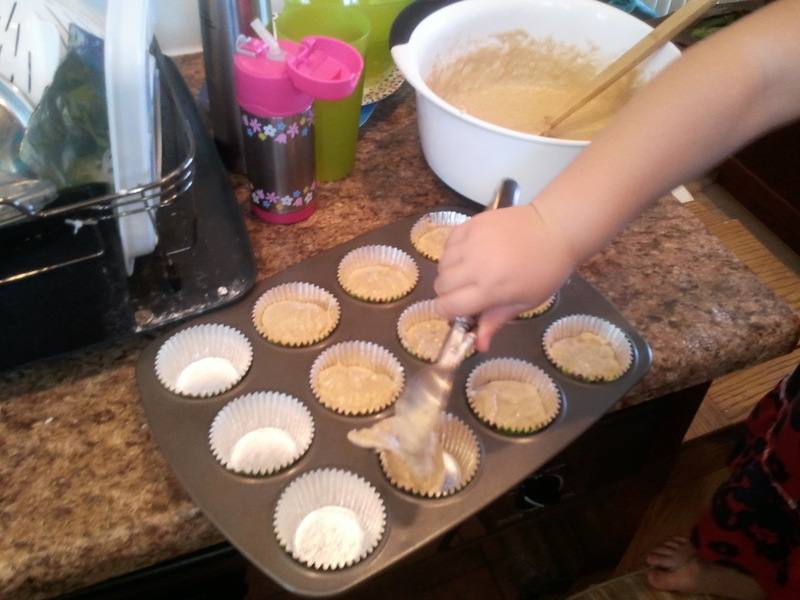 We used our Oxo ice cream scoop, which gave us the perfect amount for each muffin cup. And finally, we got delicious muffins to have on hand for breakfast this week.